In the last two and a half years, our council Facebook page has grown from 1500 likes to 8500 likes – approximately 6% of our population. We have transformed it from a neglected comms channel to an important platform for communicating and engaging with our community. Here are my 24 tips for managing a local government Facebook page. Facebook has its own terms and conditions, but you can also define your page’s expected code of behaviour. Our Redland City Council Facebook house rules are useful for reminding people to be respectful of others and their opinions when things get a bit heated. It also gives you recourse to delete comments or ban people if they have breached these rules. We set up our Facebook rules as a page tab app: find out how to do this at Facebook Developers. 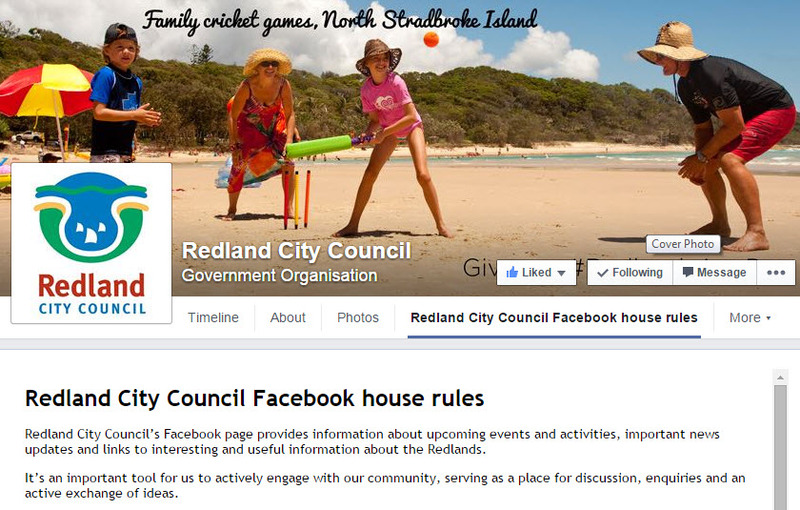 Redland City Council’s official Facebook page is monitored during business hours. For out of hours emergencies, telephone 3829 8999. Although we say our page is monitored during business hours, we also monitor at nights, weekends and on public holidays for any urgent issues. For non-urgent issues, we use holding statements when we can’t provide people with answers straight away. People are often surprised (and occasionally delighted) that we have replied to them out of hours. Quick replies are appreciated on social media, so if you can’t provide an instant answer, at least acknowledge questions or issues by using holding statements. Thanks for your question, we’re looking into this issue and will get back to you soon. Use plain English. If you wouldn’t use those exact words face-to-face with someone, don’t type them. 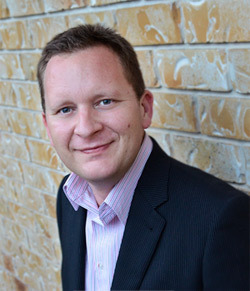 Don’t talk about your organisation in the third person. I rarely use the word “Council” on our Facebook page – it sounds stuffy and formal. Use “we” instead: people are on your page and they already know who they’re talking to. Sign your replies with your first name: people like to know there’s someone ‘real’ behind the account and it’s not just a faceless organisation. I’ve seen many council Facebook pages – both in Australia and the UK – that don’t let people post on their page. What’s the point of having a Facebook page if you’re not prepared to listen to people and open a dialogue up with your community? Using the profanity filter will make any posts with obscene language hidden by default. In your page settings you can even add your own list of obscenities. Make sure you claim your Facebook vanity URL. This means your page is accessible by visiting facebook.com/YourPageName rather than a longer string of words and numbers. Choose carefully though, you can only change it once. You cover photo is a fantastic way to showcase your region, events or campaigns. Change it regularly. Check out these tips for sizing Facebook cover photos. 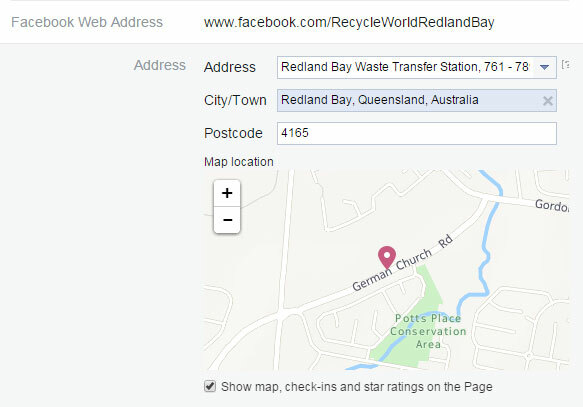 Here’s a great tip from Claire Bustin’s blog 11 things you should do with your Facebook page – remove star ratings from your Facebook page by editing your address unticking the box under the map. On a corporate Facebook page I don’t believe they add any value, although I can see their use for performing arts centres, art galleries or other destinations such as our fantastic rubbish tip shop RecycleWorld. Triple check your posts for spelling and grammar, continually making errors in posts undermines the reputation of your page and brand. If you make a mistake, expect your fans to pick you up on it. Use a social media calendar to plan your posts out for the coming month. Many of our posts are reactive to events on the day, but it’s good to have a plan for two reasons: 1) You’ll always have a post up your sleeve 2) You won’t forget about important events. Use Facebook Insights to work out when your fans are online and plan your posts for those times. Create regular content segments that support your corporate goals. Some of our segments include Flashback Friday: using historical photos in social media, environmental segments (Magpie Monday, Weed of the week) and #RedlandsAnyDay: using crowdsourced photos of our region. 15) Analyse your posts: what do people care about? Generally for us it’s community safety and emergency management updates, closely followed by crowdsourced photos of our area and job ads. Having said that, a post this week about our local law review was seen by 15,000 people and had over 120 comments. If you are continually getting poor results from a certain topic or type of post, reconsider whether you should continue with them. You have a split second to capture someone’s attention as they flick through their news feed. Use video, use photos, use text overlaid on images: make your post count! Think: what could go wrong with this post? Is it really a good idea to post that job for a new consultant on $1200 a day on your Facebook page? Probably not. We often tag partner organisations in posts. For example, in our disaster management posts we tag Queensland Fire and Emergency Services as a way of both notifying them and crediting the information to them. Facebook likes when you tag other pages, have a read of this ace blog about the Facebook Algorithm by Buffer. You can also read about how I tag pages in comments during emergencies in 52 tips for social media disaster management comms. Most people don’t understand how the Facebook algorithm works: users are not automatically shown every post by pages they like. To prevent people from missing your updates, tell them how to get notifications every time you post. This is done by visiting your page, hovering over the like button and clicking ‘Get Notifications’. This deserves a blog post of its own. There’s a lot you of useful stuff in Facebook Insights, get in there and play around! Promoting posts is a cost-effective way of reaching your audience – especially compared with the cost of traditional channels. For as little as $15-20 you can reach a much wider audience with a post. 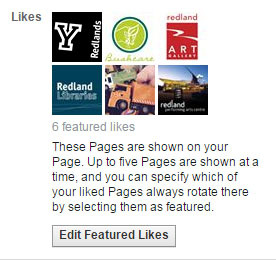 Make sure you add your organisation’s other Facebook pages to your featured likes. Not only does it look good, Facebook likes posts from pages with complete profile information. It even says so in this ace blog about the Facebook Algorithm by Buffer. Build an online community before you need it. We started posting regular storm warnings as a way to build our audience and reputation. Check out my blog 52 tips for social media disaster management #comms #smem. Items 45-49 give a few tips on how to prepare your team and page for emergencies. New blogs, links to the best online resources for communications, social media and community engagement pros and lots of other goodies! Please add hello [at] commsgodigital.com.au to your address book! 25: Use to engage your community whether as a call to action around a consultation or asking them what they would like to see as part of a redevelopment. 24 tips from @commsgodigital for managing government Facebook pages and content. http://t.co/ysRkAa2tkz. Food in community engagement: if food be the tool of the Gods, then engage on!